Here’s a list of everyday items you can use for self-defense, and how to use them. Flashlights – In the event of a natural disaster or warfare, this handy item can be used for lighting and for defending. You can use it like a club by smashing down hard on the attacker’s head, or by hitting the attacker’s hands and disabling them. You can also aim for the kneecaps which are very vulnerable if you’re in a crouching or lying position. A flashlight can also be a ranged weapon by securing it at the end of a lightweight rope, just like the ball at the end of a flail. The heavier the flashlight, the better. General writing instruments – Ballpoint pens, pencils, fountain pens – anything sharp will actually do. These are very inconspicuous, and are not generally classified as weapons, but they can disarm any attacker during desperate times. You can use a pen to gouge out eyes, or stab them in the neck or face. The faster you are, the better, especially if the attacker has the advantage of a gun. In that case, get as close as you can before he can shoot, and deal damage to the soft parts of the body like the crotch, neck, and face. 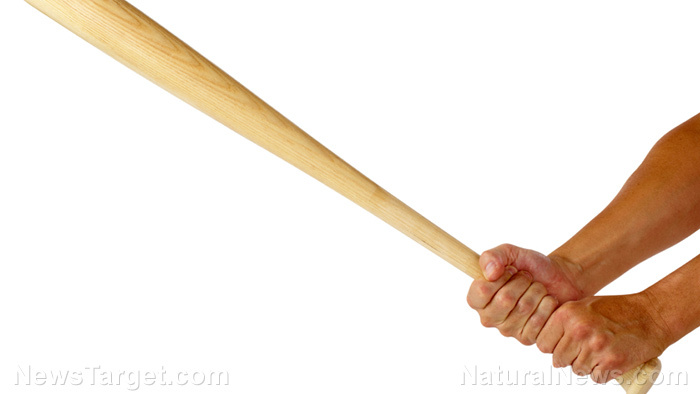 Baseball bats – If you’ve played survival video games, the baseball bat is always on the list of available weapons. It is very effective since it’s easy to use, and most anyone can take its weight. Better than ballpoint pens in efficiency, one swing can knock out a person almost every time. In survival conditions where anyone is willing to kill for supplies, most people would attach a few nails at the head of the baseball bat for maximum damage. Newspaper – Surprising as it may seem, a newspaper can be a very effective self-defense weapon. Once rolled tightly, it can serve as a mallet for pounding on a head. If you aim for the nose, you can actually break it, especially if you roll some coins or stones inside. You’ll need to secure it with some adhesive tape or twine to prevent it from unraveling or tearing easily. Stones – You can find stones almost anywhere, just make sure to choose one that is as big as your hand. If you have the muscle power, you can throw it and damage your assaulter. You would want to aim for the head of course, especially if you need time to run away. If you have a piece of cloth in hand, you can also turn your melee weapon into a sling or a flail. When on the brink of danger, it is essential that you know how to defend yourself and take safety into your own hands. If you want to learn more about getting by in the event of a catastrophe, you can stay up-to-date and learn more at Survival.news.